Find the right flagpole for residential, commercial and holiday use with the best prices at TuffFlags. 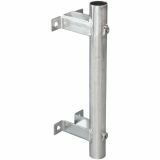 We are a one stop shop for Outdoor Flag Mounting Kits & Hardware including brackets, ornaments, unfurlers and fastners among others. Selecting the correct flagpole according to the location and local ordinances is a key factor to consider while flying the flags. Shop right away and avail ourbest prices, quick shipping and much more! 100% customer satisfaction guaranteed! Choosingthe right set of Outdoor Flag Mounting Kits & Hard ware will keep the quality of sheen and beauty of your flag display. 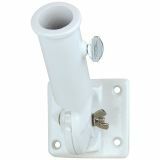 We offerall types of flag mounting hardware items. Outdoor flagpoles: From in ground to telescopic and wall mounted poles, we have a range of options to choose from. Made in USA, these poles will be a wonderful addition. 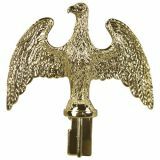 Ornaments: TuffFlags sell flagpole ornaments such as eagles, ball tops, spears and replacement components, which will enhance the beauty and elegance of the flags. 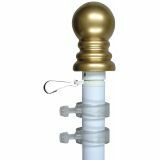 Unfurlers : Choose from a range of unfurlers and fasteners that will prevent your flag from tangling around its pole ensuring a longer flag life! 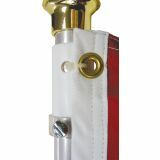 We have a range of flag mounting kits and hardware items that are made in USA which will enhance the flag flying experience. 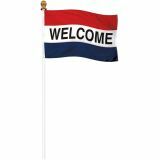 Shop for the best and latest flag accessories at TuffFlags and should you need any tips or shopping assistance, call us at our toll free number (888) 872-3524 or email us at customercare@tuffflags.com and we will assist you.